New lightweight windproof ripstop hooded SAS smock in ATP. Developed specifically as an MTP and Multicam-compatible replacement for the old DPM SAS Smock, the All-Terrain Pattern smock is a lightweight, no-nonsense windproof. Four main cargo pockets are provided - two chest and two waist, secured by button-down flaps. Two small upper arm pockets are provided, also button-down. The old style SAS Smock poachers pocket at the rear is also retained. 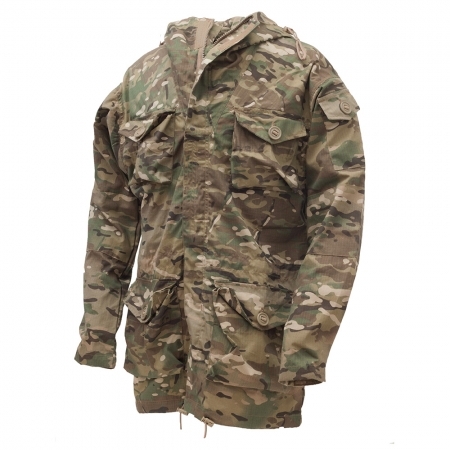 The single full-length zip is externally baffled with a velcro flap and drawstring adjustment is available at three points - bottom hem, waist and hood.